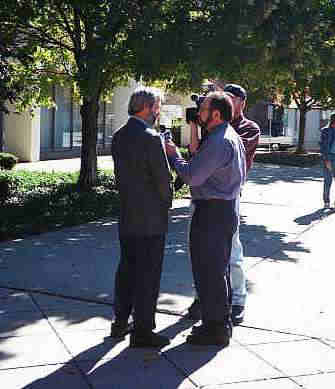 Jim Miller gives an interview in October 2000, outside Al Gore's office in New Brunswick NJ. Who: Family, friends and supporters of the late Cheryl Miller, multiple sclerosis patient and medical marijuana activist. What & Why: Candlelight memorial vigil, press conference, visits to congressional offices and related events celebrating the life of Cheryl and other patients who have passed, and urging Congress to act on federal medical marijuana legislation like HR 2233, the States Rights to Medical Marijuana Act. 7AM - to end of memorial service: Memorial Table at U.S. Supreme Court. 6:30 PM EDT - dusk: Candlelight vigil memorial service. Time TBA: MS patients visit National Capital MS Society office located at 2021 K Street, NW, Suite 715 Washington , DC 20006-1035. 10:30 AM: Press Conference, Rayburn House Office Building. Immediately following, patients and supporters will visit their representatives and other House congressional offices. Jim Miller, 51, of Silverton NJ will push his late wife's wheelchair from Seaside Heights to Long Branch NJ, Saturday, August 30, 2003. Cheryl Miller died June 7, 2003 after suffering from multiple sclerosis for 32 years. He will be joined by family and friends. Cheryl was an outspoken advocate for medical marijuana for the last 12 years of her life. She was arrested for consuming marijuana in a congressman's office in 1998, one of many Washington DC actions she was involved in. Friends and supporters have pledged money per mile walked for Jim's 26 mile walk. The money is to be used to help get medical marijuana patients to Cheryl's memorial service being held in Washington DC. The memorial service for Cheryl will take place in front of the Supreme Court beginning 6:30 PM Sept. 22, 2003 (Monday). It will be preceded by a day-long display of a memorial table presentation of personal items, letters and pictures of many other medical marijuana patients that have also passed away. The following day (September 23) Jim will speak at a congressional press conference in the Rayburn House Office building at 11:00 then lead patients that will have come from around the country on a lobbying effort on the Hill. This weekend's memorial fundraising walk will begin at 6:30 AM at the old municipal parking lot located at the convergence of Rt. 37 and Rt. 35 in Seaside Heights. It will end at 1187 Ocean Ave. Long Branch, NJ. the home of US Rep. Frank Pallone. Cheryl and Jim had been in contact with Rep. Pallone since 1991 concerning medical marijuana. Pallone promised Cheryl years ago that he would confer with Rep Rob Andrews about a medical marijuana bill that Rep. Andrews is a cosponsor of, and has since refused to do so. Mr. Miller will arrive at 1187 Ocean Ave. approximately 6:30 PM and stand vigil all night until 10:45 AM Sunday, a year to the minute from the last time Rep. Pallone saw Cheryl. Jim Miller says, "It's time the war on medical marijuana patients comes to the homes of congressional representatives that support it. Mr. Pallone's decisions and unkept promises have affected Cheryl and me in our home for a long time, all the way until the day that Cheryl died. It is time for him to honor his promises." Begin at 6:30 AM at the old municipal parking lot at the convergence of Rt. 37 and Rt. 35 in Seaside Heights, NJ. North on Boulevard to Rt 35, 0.7 miles. North on Rt 35 passing Mantoloking Rd. 8:45 AM, crossing the bridge over the Manasquan River at 10:30 AM. Traveling about one mile feast on Ocean Rd. to where Ocean Rd. turns into Union Rd. then one block continued East on Union Rd. to the Ocean. (Ocean Ave.) 12:30 PM. North on Ocean Rd. through Spring Lake (1:00 PM) Belmar (2:00 PM) Avon by the Sea (2:30 PM) Bradley Beach (3:00 PM) Ocean Grove (3:30 PM) Asbury Park (3:45 PM) Deal (4:30 PM) There is boardwalk along Ocean Ave. from Belmar to Deal that I may be using at times that can be obscured by sand dunes. Deal--Traveling along the east road around Deal Lake to the West side where Ocean Rd. continues north. Three miles more on Ocean Rd. to Lincoln Rd in Elberon. Just past Lincoln Rd is 1187 Ocean Ave. the home of Rep. Frank Pallone. It is in Elberon which is a Long Branch mailing address. Arriving between 5:30 PM and 6:30 PM. Washington, DC: Patients and their caregivers will converge on Washington, DC on September 22 and 23 to lobby for legal access to medicinal marijuana and pay tribute to Cheryl Miller. Miller was a longtime medicinal marijuana activist and MS patient. She died from pneumonia and other MS-related complications on June 7, 2003. In honor of Cheryl's dedication and struggle, NORML and several other prominent drug law reform groups will be holding a two-day medical marijuana lobbying effort on Capitol Hill. Scheduled activities include: a candlelight vigil in front of the Supreme Court, a press conference on Capitol Hill, and a patient-lobby day to raise awareness in Congress of the need for medical marijuana and the passage of House Bill 2233, the "States' Rights to Medical Marijuana Act." "Throughout much of her life, Cheryl risked arrest and jail to use the only medication that alleviated her suffering," said her husband Jim Miller, who is organizing the project. "Cheryl chose to take this risk, though many other patients are simply forced to suffer. I hope that by bringing attention to the plight of my late wife Cheryl, I can hasten the day when marijuana will be made available so that others are no longer needlessly forced to suffer with pain or risk arrest." For more information on or to donate to The Cheryl Miller Memorial Project, please visit: http://www.cheryldcmemorial.org or contact Chris Mulligan of NORML at (202) 483-5500.